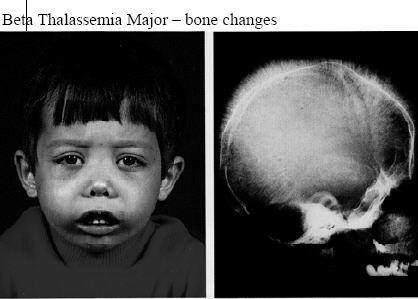 given rise to the terms «Cooley facies» or «mouse facies» in describing patients with thalassemia. If blood transfusions have been carried out since birth, up to 50% of patients may either not present these manifestations or do so only in mild form . Radiologically, a characteristic brush-like image is seen in the zone of the cranial vault, depending on the timing and efficacy of the transfusions made. The alveolar bone generally shows rarefaction with thinning of the cortical layer. Obliteration of the paranasal sinuses is a classical X-ray finding. Unilateral hypoplasia of the maxillary sinus affects 10% of patients, with comparatively more frequent involvement of the sphenoidal and frontal sinuses. Primary hypoplasia of the paranasal sinuses is associated with different syndromes such as cleidocranial dysostosis, mandibulofacial dysostosis or Collins-Treacher syndrome, Crouzon syndrome, achondroplasia and Down syndrome, as the most common disorders. In addition, a differential diagnosis must be established with primary sinus hypoplasia associated to sinusoccupying masses, to avoid unnecessary and inappropriate treatments – as in the case of sickle cell anemia, polycythemia vera, fibrous dysplasia, ossifying fibroma, giant cell tumors and Paget’s disease . On the other hand, the paleness of the oral mucosas is correlated to the degree of anemia present. The existence of caries and gingivitis becomes more relevant if the patient has moreover been subjected to splenectomy.